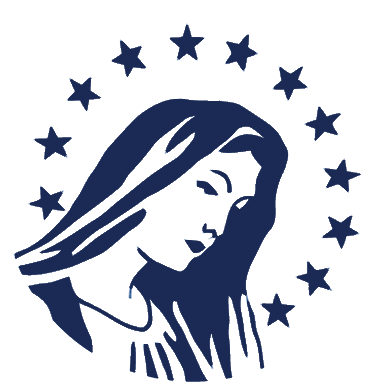 Mother of Divine Grace School is a distance education program which helps parents implement a Catholic classical education in their home. It is designed in the light of the classical principle that the goal of education is to teach children how to think; to help them learn the art of learning. If children learn how to learn, they will be equipped for life, able to master any subject when it becomes necessary or desirable. Further, the curriculum is faithful to the doctrine and teaching of the Catholic Church, which enlightens and informs all the areas of the curriculum. The tools of learning, through which children learn the art of learning, are acquired by concentrating, at each stage of intellectual formation, on the areas of development that are appropriate to that stage. Experience has shown that in the earliest years, kindergarten through second grade, one needs to emphasize the first tools of learning: reading, writing, and arithmetic. One should also work on observation and memorization, and filling the imagination with noble and heroic images. In the grammatical stage, third through sixth grade, memory and observation are the heart of the method of the curriculum. In the dialectical stage, seventh through ninth grade, the focus of the method of the curriculum should be analysis. And in the rhetorical stage, tenth through twelfth grade, it is communication, emphasizing the power and beauty of language, that forms the curriculum. At all levels the doctrine of the Catholic Church is emphasized. Each enrolled family is paired with a consultant who has experience homeschooling, and who helps the parents choose curriculum resources appropriate to their own family's talents and needs. Then the consultant helps the parents learn how to teach using the method of the classical curriculum. Additional consultations are available if desired. Mother of Divine Grace School is committed to supporting parents in their role as the primary educators of their children, by helping them with curriculum choices and training in the classical method of education. These choices and this training are faithful to the understanding of education proposed by the Catholic Church.